I recently saw that a few months back, Unshelved had a Friday comic which raised a rather interesting and relevant question. 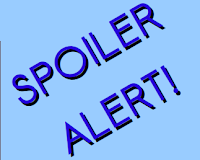 While reviewing a graphic novel version of The Odyssey, one of the characters calls out "spoiler alert". The response is amusing but also thought-provoking: "This story is thousands of years old. The statute of limitations for spoilers has expired." It's a very interesting question... at what point (if any) does a story's main plot become part of the public domain? When does it become legitimate to tell the whole story, end included? I have to wonder about the classics. Who doesn't know the end to Hamlet? Or Pride and Prejudice? There are modern books as well: are there very many people who haven't had aspects of Harry Potter spoiled for them? Many of the most popular stories inevitably get told and retold so often that it becomes almost impossible to avoid having it "spoiled". At the end of the day, though, we do try to avoid spoiling books. We keep our blurbs to a relative minimum (though we really need to instate the 10% rule) and we typically keep our reviews spoiler-free, or at least include a spoiler alert to ward off readers who might not want to know what happens. There's a level, though, when the surprises in the story cease to be the driving force of the book. It's a bit like watching the movie after reading the book (or the opposite) - you already know the story, but you're experiencing it for the nuances and the way it's told. The plot - the actual occurrences - aren't the only reason for enjoying the story. By this point, you're expected to know what happens. You're reading the book (or watching the movie) for everything else - the writing, the character building, the clever one-liners, the complexity... whatever it may be. I don't know at what point we hit that expiration date but I think it does exist in some form. It's not necessarily correlated to the age of the story, but perhaps to the popularity and the ubiquity. I'd never consider telling someone the development and ending of All Quiet on the Western Front, but no one really hides Lord of the Rings' ending - in fact, you're almost expected to know what happens (vaguely, at least). The more people discuss a good story, the more likely others are to be exposed and that exposure doesn't mean that you'll necessarily enjoy the story any less. Look at retellings, look at the classics. I think there is a spoiler alert expiration date. For most books, at least (there are obviously a few books that hinge on certain surprises or lose some of their power once you know the end... All Quiet on the Western Front comes to mind again). It changes from book to book and it isn't set in stone, but I believe it's there. What do you guys think? I feel that as a spoiler junkie myself, I don't get to weigh in on what spoils a book for everybody else. In my mind, the more spoilers, the better. But I don't think the fact that a book has been around forever means spoilers are no longer spoilers. Nobody has read everything. Even very famous things, there are always massive tons of people who haven't read them yet. Not because they are stupid but just because nobody has read everything yet. So if you are going to respect people's need not to be spoiled, I don't see any reason why it shouldn't extend all the way back in history. Jenny, I don't think it's a matter of people having read the book, but rather knowing the book or the story. I know the story of The Odyssey without having read it, but I don't feel it's been "spoiled" for me (despite being the kind of person who hates spoilers with a passion). It just feels like it's legit to know the story after so many years. I wouldn't expect someone to avoid major plot points, not with a book so old, but more importantly, and so retold. Whew, this is a great question. I don't know! I think I wouldn't want to know the ending of any book I'm about to pick up but when it comes to classics, it's almost impossible to avoid- certain things just become part of our cultural landscape, like Jane Eyre or Rebecca, and it seems like everybody knows! Great question! I think 20 years is a good spoiler expiration "rule." Except if the book is a mystery, then there is no expiration date since the plot turns on "who dunnit." Oy oy oy...please count me in on the No Expiration side of the spreadsheet! I have had three major classics spoiled for me (I shan't even say which ones they are, lest someone else not realize that there is an event to be anticipated in them). And because it was quite an undertaking to read those three (two of which were well over the 500 page mark, the other in translation), it was even more of a blow for me than if I'd stumbled on a spoiler for a contemporary novel that I'd've completed more easily. In one instance, I was only about 100 pages into the story and a reading friend (and, yes, we remained friendly after that!) said "Well, you know they both die at the end, right." Not questioning, just saying. And then defending herself by saying that surely I'd seen the BBC broadcasts if not read it previously. Well, no. Intellectually, I do understand the argument that you're putting forth, but emotionally I still want to feel the book -- unspoiled -- for myself first.